Chrome is the most classic looking finish you can get for your vehicle and RealTruck is happy to carry Stampede chrome hood deflectors. Engineered with an extremely aerodynamic reverse flip, the Stampede chrome bug deflector's main job is to protect your hood and windshield from bugs and small debris like rocks. No one likes getting chips on their truck or SUV, and getting a deflector is a great way to cut down on those little annoyances in life. Stampede's chrome shields are made from impact resistant acrylic. They're then put through a wet electroplating process to get their chrome finish. This is the same process manufacturer's use on the trim pieces your vehicle currently sports. By their very nature, they're UV resistant and made to sparkle and glisten in the sun's rays like a diamond. The form fitting design is standard for each chrome deflector ordered as they are made to fit the year, make, and model of your particular ride. Because they mold perfectly to each dip, curve and swoop of your shield, you get an OE look and a product that performs well. These bug shields mount in a variety of ways - in front of the grille, behind the grille, or under the hood. Stampede has made sure that each hood shield can be easily mounted at home without any drilling or cutting. Easy to follow instructions are included along with any needed hardware. Stampede offers a one year warranty against defects in materials or workmanship on these chrome bug shields. 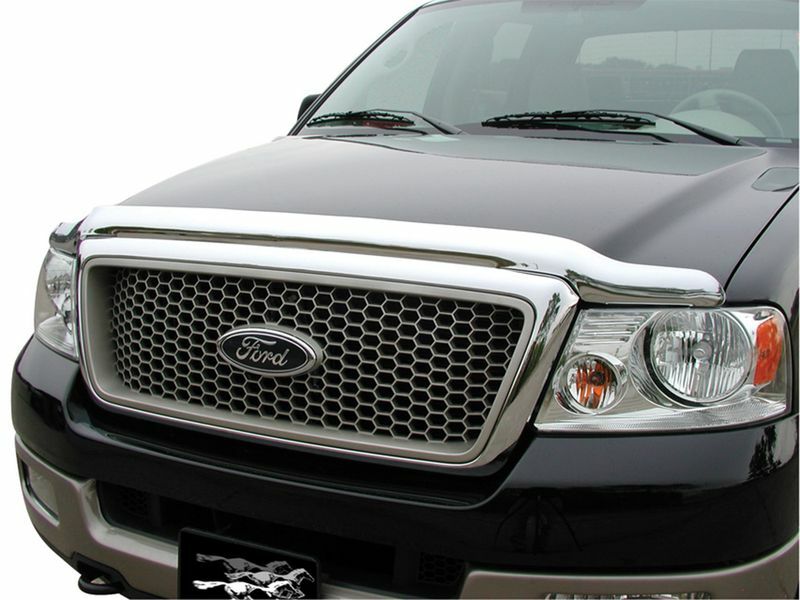 A Stampede chrome bug deflector is fairly easy to install at home on most vehicles without any drilling or cutting. Installation is pretty similar for many other vehicles, but if you would like a copy of instruction for your particular vehicle or would just like additional information, please call us at 1-877-216-5446 or 1-701-253-5906.